It’s so easy to imagine, those two characters striding down the Road to Emmaus that we can almost hear them talking, maybe even arguing about what happened. What on earth were they to make of all this! Jesus was supposed to be the Messiah. Jesus was the One who had come to liberate Israel, to free the people from oppression. Jesus was the One who was supposed to draw the people back to God, restore the relationship between God and God’s people. Now Jesus was gone, and what had changed? Now, Jesus was gone, and the Roman Empire was still oppressing them, still inflicting such pain and hardship, still killing them. Was it all a mistake? Was it all a lie? Had they been fooled by some kind of cruel hoax—were they wrong to put their hopes in this man from Nazareth? They had trusted Jesus believed in Jesus, followed Jesus. Their lives had been changed. They had seen the lives of others changed and they had expected even greater changes to come. Jesus had confronted corrupt powers. Jesus had charmed great crowds. Jews and Gentiles alike responded to the truth of Jesus’ teaching. Rich and poor had come to Jesus, believing in Jesus’ healing power. But Jesus had been shamed, and ridiculed, and humiliated, and crucified and now Jesus was dead. Well, was Jesus dead? Some said they’d seen Jesus, alive! Not that Jesus had survived the crucifixion by some miracle of strength, but that Jesus had risen from the dead. They seemed so totally convinced by their own experience…were they confused by their own grief? Were they delirious? Had they loved this Jesus so much—invested so much hope in Jesus life and leadership—that they simply could not let him go? And what did ‘resurrection” mean? Apparently it was not the resuscitation of a corpse. Jesus wasn’t revived to resume his former life; to take up his broken body until the day he might die again. No, somehow this was some new mode of being that seemed to be spiritual to some and yet real to others. And, if Jesus were risen from the dead, what would be the point of all that? What was the point to a Messiah—to a presumed political and religious leader—if Jesus wasn’t able to lead people here on earth? How could Jesus restore Israel when he had so easily been defeated by a handful of Roman guards? How could he bring release to the captives, how could he bring justice for the poor, how could Jesus advocate for the widows and the homeless? How could Jesus call people to account for all the ways they had strayed from God’s intent, now? What good could come from some kind of spiritual ghost? We can hear these two friends wrestling with each other and with their own hearts on the road that day! We can imagine the questions they might have had. We can feel the agony they might have experienced. How crushed they must have been to lose their beloved leader, to have witnessed the violence that triumphed over their champion. This story of wrestling with unanswerable questions was written at the turn of the first century, but the wrestling continues in the hearts and minds of so many of us. What are we to make of the life, death and resurrection stories of Jesus of Nazareth? Just as the first century writer of this story struggled to understand the apparent death of Jesus of Nazareth, many of us are also struggling to understand the apparent death of Christianity. We’ve heard so many reports about the death of Christianity, indeed about the death of God, that it is almost impossible to believe that either can survive. In fact, there are so many reports of the death or the impending death of Christianity that it makes even the most devoted and faithful followers wonder if God is indeed dead. 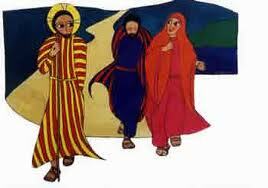 And so, we struggle down the road to Emmaus talking with one another about what it all means. If only someone would appear to us and open our eyes to and cause our hearts to burn with us, and open the scriptures to us. Sure there have been moments of revelation, but on the whole I think it’s safe to say that somewhere along the way, religion itself has been high jacked. God may not be dead, but it appears for all intents and purposes that God may need life support. Certainly, somewhere along the road to Emmaus Christianity has been high-jacked. While I was traveling along the road to Emmaus, I heard tell of a fellow traveler called Mahatma Gandhi. Gandhi was a Hindu who studied all the great religions of the world and after completing an exhaustive study of Christianity he came to the conclusion that Christianity was the most compassionate, most loving, most complete form of religion and the best way to encounter the divine, and so he resolved that he would become a Christian. Then he went to church, and in the church he discovered a great chasm between the teachings of Jesus and the way Jesus’ followers actually lived, and so Gandhi resolved to become a Christian just as soon as he actually met a Christian. As we travel along the road to Emmaus struggling with one another about what to make of it all, there are religious terrorists everywhere along the way; religious terrorists of every kind. There are folks holding on to their sacred scriptures so tightly and insisting that we believe; believe every word! These religious terrorists are only too willing to tell us what it all means and exactly what the scriptures say and how we out to understand absolutely everything just exactly the same way that they understand it. Every once in a while we met a stranger along the way who opens our eyes and we grasp a flicker of recognition. Which only makes the religious terrorists wave their scriptures at us as if their ancient texts were weapons, and so they threaten us with eternal damnation if we do not believe as they believe. I met a character the other day on the road to Emmaus. Her name is Karen Armstrong; she’s one of the world’s authorities on religion who has written dozens of books on the religions of the world. I learned from her that “belief which we make such a fuss about today is only a very recent religious enthusiasm that surfaced only in the west in about the 17th century.” The word belief itself originally meant, “to love” “to prize” or to “hold dear.” In the 17th century its meaning was narrowed to mean an intellectual ascent to a set of propositions. We get our word creed from the Latin, “Creedo” which means, “I believe.” Armstrong tells us that “’creedo,’ did not mean that ‘I accept’ certain creedal arguments of faith it meant ‘I commit myself.’ Or I engage myself.” Armstrong insists that religion is not about believing things…religion is about behavior. Religion is about behaving differently. Instead of deciding whether or not you believe in God, first you do something; you behave in a committed way and then you begin to understand the truths of religion and religious doctrines are meant to be a kind of summons to action; you only understand them when you put them in to practice. Armstrong tells the famous story of the great Rabbi Hillilel the older contemporary teacher of Jesus. A pagan came to the Rabbi Hillel and offered to convert to Judaism if the Rabbi could recite the whole of Jewish teaching while he stood on one leg. So, Hillel stood on one leg and said, “That which is hateful to you do not do to your neighbour. That is the Torah the rest is commentary. Go and study it.” Go and study it was what Hillel said, and in your studies you must make it clear that every single word of the Torah is a commentary on the Golden Rule. The great Rabbi Meier said that, any interpretation of scripture which lead to hatred and disdain or contempt of other people, any people whatsoever was illegitimate. This struggle to find compassion in the scripture is a good dress rehearsal for doing the same ordinary life. We are living in a world where religion has been high jacked. Were terrorists cite Qu’ranic verses to justify their atrocities. Where instead of taking Jesus’ words: “Love your enemies,” “don’t judge others,” we have the spectacle of Christians continuously judging other people; Christians endlessly using scripture as a way of arguing with other people, Christians putting other people down. Throughout the ages religion has been used to oppress others because of human ego and human greed. The great religions, also insisted that you could not and must not confine your compassion to your own group, your own nation, your own religion, you must have concern for everybody; not just love your neighbours, but love your enemies, have compassion for the stranger. “We formed you,” says the Qu’ran, “into tribes and nations so that you may know one another.” But, sadly religious illiteracy has led us to a place where people think that religion is about believing things. We equate faith with believing things. We call religious people believers as if that is the main thing that we do. Behavior: compassion and the Golden Rule has been supplanted by believing. Religious people have become more concerned with being right rather than behaving with compassion. Religion is failing us at the moment. Any ideology or religion that doesn’t promote a sense of global understanding and global appreciation of each other is failing the test of our time. Do not do to others what you would not have them do to you. We should not treat other nations in ways that we would not want them to treat us and not just nations, or people, but the Environment. We must treat the earth with the same kind of compassion that you would want from creation; the same kind of compassion you would want from the divine. As we travel this road to Emmaus, it becomes less and less important for us to believe in a certain way and vital that we behave with compassion. God is not dead. God is alive and well. God walks with us on the road. God is our companion on the road. The very word companion comes for the same Latin word that the French get their word “pain,” which means bread. Companion literally means “bread with.” The companion is the one who breaks bread with us. It is in the intimate act of breaking bread, of sharing a meal with someone that we come to know that person. When we meet a stranger on the road, we begin not with believing or not believing what that stranger has to say to us or what that stranger represents to us. We begin with the breaking of the bread. In the breaking of bread with the stranger we will be able to recognize the divine presence that dwells in the stranger and the stranger will be able to recognize the divine presence that dwells in us. At one of our congregational pub nights, we met a Quaker who kept reminding us about the beauty of Homer’s: The Iliad. The Iliad was for this man who claimed to have given up on religious instructions a sacred text. In the Iliad, Homer tells the story of the ten year war between Greece and Troy and in one incident, Achilles the famous warrior of Greece decides to take his troops out of the war and the entire war effort of the Greeks suffers and in the course of the ensuing chaos Achilles beloved friend Petropolus is killed in combat by one of the Trojan princes: Hector and Achilles goes mad with grief and rage and the quest for revenge. Achilles kills Hector and he mercilessly mutilates the body and he refuses to give the body back to the family, which to the Greeks and Trojans alike meant that Hector’s soul was doomed to wander eternity aimlessly lost. In the darkness of the night Prium the king of Troy, Hector’s father, an old man sneaks into the Greek camp incognito. Prium makes his way to Achilles tent determined to ask Achilles for the body of his son Hector. The Greeks are shocked when the old man takes of his disguise; removes his head-covering and shows himself and Achilles looks at him and thinks of his own father and he starts to weep. Prium looks at Achilles the man who has murdered so many of his sons and he too starts to weep and the sounds of their weeping filled the house. The Greeks believed that to weep together created a bond between people. Achilles takes the body of Hector and hands it ever so tenderly to the father and the two men look at each other and see each other as divine. Karen Armstrong insists that that is the ethos that is found in all the religious. It is what she describes as religions ability to overcome the horror we feel when we are under threat from a stranger. Religion should help us to over come the horror when we feel that we are under threat by our enemies so that we can begin to appreciate the other. Armstrong reminds us that the word for “holy” in Hebrew is Kadosh which means “separate” or ‘other”. It is the otherness of our enemies that can give intimation of that utterly mysterious transcendence that is God. Armstrong has called forth a movement among the progressives of all the great religions and working with the United Nations, and the likes of Coffee Annan and Desmond Tutu she is calling for those who claim a particular religion to begin to behave with a Compassionate ethos. She is calling for religious moderates and progressives to adopt the Golden Rule as the basis for a world Charter of Compassion. She is insisting that texts that are being abused…need to be denied and we need to be instructed by the need to wrestle compassionate interpretations. Texts of every kind, whether they are from the Bible, the Qu’ran the little Red Book, or a constitution, or a beloved piece of literature or a manifesto; sacred or profane. We must not let destructive, abusive, inflammatory, discriminatory, or hate filled interpretations of any kind stand we must be guided by compassion. So, as we wander toward Emmaus these rumors of compassion lead us to believe that God is not dead at all, but that God is alive and well and comes to us in the guise of a stranger. With our hearts burning with us as the stranger talks to us on the road, the scriptures are opened to us. It’s time for us to reclaim the Christianity that has been high-jacked and resurrect compassion so that our faith can be a pathway to peace. It’s time for us to reclaim that ancient ability to recognize the divine in the eyes of the stranger, and yes even in the hearts of our enemies. Believing that God is alive is not the point. Behaving like God is alive is the beginning of compassion. For those of us who call ourselves Christian, recognizing Christ, recognizing the divine in the stranger is the pathway to justice, peace, and mercy. Let it be so among us. This entry was posted in Adult Education, Bible Study, Evolutionary Christianity, Progressive Theology, SERMONS and tagged emergent theology, evolutionary christianity, Karen Armstrong Charter for Compassion, Luke: 24:13-49, Lutheran sermon Easter 2B, Lutheran sermon Easter 3A, Lutheran sermon Luke 24:13-35, Marcus Borg, progressive christian sermon, progressive Christian sermon Easter 2B, progressive Christian sermon Easter 3A, progressive Christian sermon Luke 24:13-35, progressive christianity, progressive theology, road to Emmaus by Rev. Dawn Hutchings. Bookmark the permalink.